27/05/2017: 3 babies, day 23 of the gestation period. Begasti is one of my all-time favourite rats. She is so much FUN in a lovely sleek soft shiny body (we suspect she has a satin-like coat modifier) and she is absolutely crazy! 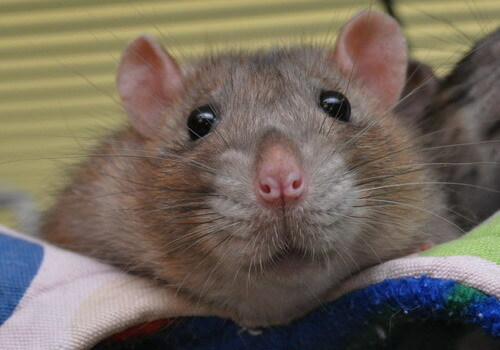 So cheeky and licky, active and intelligent - very much a ratty rat. Shortly after she was born, I was hit by sendai virus following exposure at a rat show, and Begasti and her sisters thankfully survived (despite the virus claiming a large number of rats, including her sire, my heart rat Avanti). I paired Begasti up twice with bucks I had borrowed from my homes, but she didn't take, and as I was really keen to get a litter from her and there was a possibility that her fertility had been affected by the sendai infection, we decided to try her to Sunnymead, as he lives here and we could therefore keep trying more easily if she came back into season. He is a big handsome buck with a stable temperament. We were expecting agouti and black with a chance of cinnamon/mink and dumbo, and ended up with a trio of black does (two dumbos!) - our lovely little "limited edition" litter.